The portfolio of esd electronics gateway familiy covers the linking of CAN and CANopen to industrial field bus and Ethernet systems like PROFIBUS-DP, PROFINET, EtherCAT and Cloud. 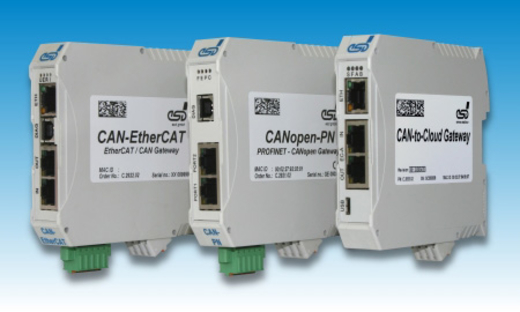 All CAN / CANopen Gateways to PROFIBUS respectively PROFINET have in common that they do not need external configuration by the user. The complete configuration and setup is executed by means of the PLC's application program. Thus the exchange of a gateway in the field can be accomplished quite easily. Additional external tools or resources are not necessary. Bridge functions for data exchange between two independent CAN segments - wireless as well. CANopen: any number of SDOs and PDOs as well as NMT Master, Heartbeat and Sync.